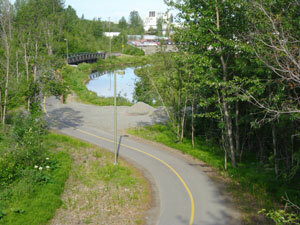 This 2.6-mile-long trail opened in August 2008. It cost $12 million to build. It has a number of bridges over the creek and a corkscrew bridge over the railroad tracks. During summer, when salmon swim upstream, many cyclists pause to watch anglers catch fish. Just before the trail ends in Mountain View, there is a giant new fish hatchery. The hatchery is 145 thousand square feet and cost $93 million to design and build. It has a long visitors corridor with windows above the dozens of giant fish tanks. There is no admission charge. It is located on the southeast corner of Reeve Blvd and Post road. To get to the trail from DBR, take a RIGHT on E and a RIGHT on 2nd. Trail begins behind Comfort Inn. William J Hernandez Fish Hatchery. Open Daily 8am -4pm. Free. When trail ends, decide whether to retrace and return downtown, or make a circuit. Before returning downtown or continuing to make a circuit, consider visiting the Alaska Museum of Natural History located at 201 N. Bragaw. Admission is $5, children (5-12) $3, families $15. Open Monday - Friday 10 -5. If you choose to do a circuit you will bike through Merrill Field where thousands of small airplanes are parked. After exiting Merrill Field you would then ride south to the the Chester Creek Trail where you have the option of heading west to the Coastal Trail or east to the University. To ride a circuit, bike on Richmond Ave three blocks then take a right on Taylor. Pass car wash on right and proceed through intersection. Now you are on Mt. View Dr. Cross Glenn Hwy. Now you are on Airport Heights. Quick right onto Merrill Field Dr. This low-speed road is a lot like a bike path. It curves through the airfield then ends at a busy intersection. Cross E. 15th/Debarr to Lake Otis Blvd the ride on sidewalk (there is no shoulder) to E. 20th. Use E. 20th traffic light to cross road then ride on sidewalk against traffic short distance to softball field at bottom of hill, exit sidewalk with a left which brings you to Chester Creek Trail. Now either ride with the flow of the creek (left/west) to the Coastal Trail or take a right and head east to Goose Lake and University. Note: Another circuit option is to visit Costco located at 4125 Debarr Road. This route would not include Merrill Field. Ask for directions at the bike rental.